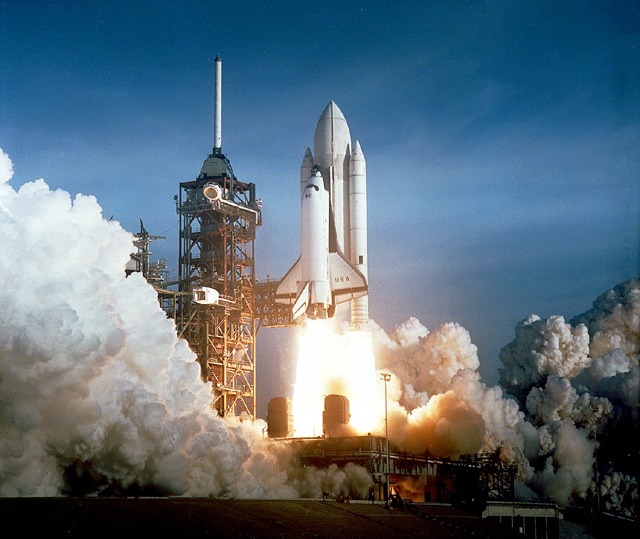 The program was launched at the end of the program Apollo at the beginning of 1970s (January 5, 1972 by President Nixon) a time when budgetary restrictions for the NASA already began, what led them to look for the most economic means to maintain a human presence in the space. 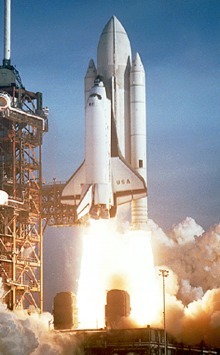 Every shuttle was conceived to make hundred of flights. One of the main objectives of the program was to build and to deserve an orbitale space station, what is coming true with the assembly of the international Space station (ISS), and to send satellite in orbit. The shuttle was also conceived to repair satellites in orbit, and to bring back orbital payloads. 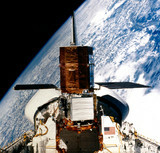 It was the case of Solar Max satellite in 1985 and repeatedly the spatial telescope Hubble. Thinking ahead to what NASA would do in terms human spaceflight after the Apollo Moon landings, in the President's Space Task Group, headed by Vice-President offered several scenarios. The Space Task Group report three main options: a human expedition to Mars, and Earth-orbiting space stations, and a reusable space or Shuttle. President Richard Nixon rejected the first options as too expensive. NASA then decided to for a Shuttle as a building block for other goals, especially the space station. NASA officials that the Shuttle would be more popular with and the White House than the other, more options. Nevertheless, in 1971 the Office of Management Budget (OMB) slashed NASA's budget, eliminating any growth the foreseeable future. During the development program that soon followed, some managers discounted or ignored predictions of such high flight as unrealistic. Indeed, some managers felt that such proclamations were really for public consumption or public purposes and thus did not take them seriously. retrospect, Robert Thompson, the Shuttle project manager at Johnson Space Center (JSC) said that I never we d fly more than once a month, 18 flights a year [at the maximum]. Even virtually all space payloads were to fly aboard Shuttle, Thompson couldn t figure what the country want to do with all those flights that predicted by Mathematica.22 Another key manager remarked that was a design requirement for 55 flights per mainly to support the economics of the system. effect, the tail was wagging the dog; instead creating a launch system versatile and rugged enough launch often and thus reduce operations costs, some were artificially creating a launch market to justify particular kind of technology.